Percy ran Thomas' branch line while Thomas ran the Main Line with Edward, and was allowed to stay after the big engines surrendered. At first, Percy liked to annoy the big engines. Percy was later waiting at Tidmouth but forgot to whistle to the signalman, and thus was startled when Gordon came running towards him with the express. Gordon managed to stop in time, but Percy was frightened, ran away, and ended up in a sandbank. 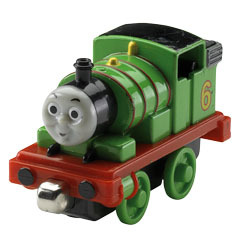 He was rescued by Gordon, and took up the duty of station pilot at Tidmouth.